Or contact Beyond Furniture on 1300 11 22 33 for further details. Make a statement in your entry way, the Brando features a statement making modern design with angled components and a feature light. Made up of a rear panel with a tapered design and a light in concealed in the top thickness, and a perpendicular support with angled cut out supporting the glass piece which echoes the angled design and hovers 7/8 of the way up the console. The Brando looks sensational with a feature vase or a mirror or print hung above it. Aside from making a modern statement in a hall or entry way, the Brando could be used on an empty wall in a living or dining room, or in commercial or retail applications in an office foyer or shop with a fresh flower display. 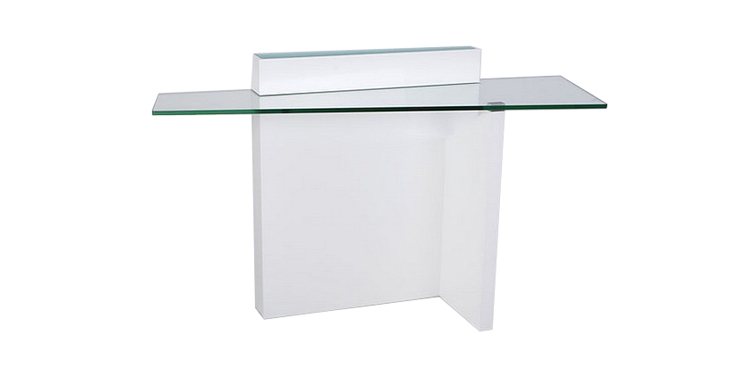 The built in light is a halogen tube, with a removable frosted glass piece at the top of the buffet for diffusion. The light can be controlled via a concealed switch. You will need nearby access to a power point to plug in the lamp function. Internal Construction: Australian MDF with Italian Polyurethane paint finish (Glossy PU has 6 coats of PU- 3 UV base plus 3 top); anodised aluminium details, frosted glass top & tempered clear glass. Contact Beyond Furniture on 1300 11 22 33 for more details.